Nordon Block Ice Machines are robust, easily maintained and very reliable. 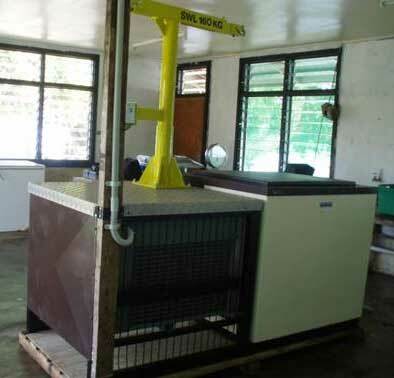 As a result many units are used in remote locations throughout the Pacific Islands where the infrastructure and maintenance support is limited. 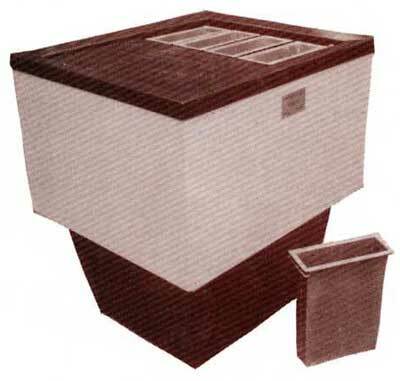 Nordon Block Ice Machines produce ice from fresh water in containers which are immersed in refrigerated brine. After approximately eleven hours ice is ready for harvesting. All Nordon ice machines are manufactured as self-contained one-piece units with brine tank and refrigerating unit mounted on a common frame. The refrigerating systems are pre-charged with environmentally friendly refrigerant and electrically wired for connection to the power supply. All machines are tested before they leave our factory. Nordon Block Ice Machines are supplied with everything necessary to produce ice, all you have to do is supply the water and electricity ! Approximate production output at 32° C ambient and 21° C water temperature. A "Bamboo beige" coloured freezing tank and silver stainless steel top frame, provides the Nordon Model N150 Block Ice Maker with an attractive colour contrast. The Nordon Model N150 Block Ice Maker can be powered from a 240Volt 50Hz generator if required. The Nordon Model N150 Block Ice Maker uses a fibreglass (FRP) Freezing tank and stainless steel for Ice Mould support frame to minimise corrosion. The refrigeration system is a low maintenance fully sealed compressor with an air cooled condenser. The freezing coil supported in the Freezing Tank is designed for fast, efficient freezing. Quick release stainless steel Ice Moulds allow the ice blocks to be easily removed. Each ice block is approximately 100x300x360mm and weighs approximately 9 Kgs. The Nordon Model N150 Block Ice Maker is supplied with an insulated dust cover. The Nordon Model N150 Block Ice Maker production output at 32º C ambient and a water temperature of 21º C is approximately 72Kg per harvest(8 blocks). The Nordon Model N150 Block Ice Maker can be harvested approximately every 11 hours, providing two harvests per day for a total of 144 Kg of block ice. If required, crushed ice can be obtained by supplementing the Nordon Model N150 Block Ice Maker with a Nordon Ice Crusher. Click here for more details on the Nordon Ice Crusher. Contact us to find out how you can purchase a Nordon Model N150 Block Ice Maker. The Nordon Model N400 Block Ice Maker has been engineered as a reliable, low cost and easy to operate ice maker with a long, maintenance free life. A "Bamboo beige" coloured freezing tank and "silver" top frame, provides the Nordon Model N400 Block Ice Maker with an attractive colour contrast. The Nordon Model N400 Block Ice Maker uses a fibreglass (FRP) Freezing tank and stainless steel for Ice Mould support to eliminate corrosion. The refrigeration system is a low maintenance accessable hermetic compressor and an air cooled condenser. The freezing coil supported in the Freezing Tank is designed for fast, efficient freezing. The Nordon Model N400 Block Ice Maker is supplied with a dust cover. As standard, the Nordon Model N400 Block Ice Maker operates from 415V 3 Phase 50Hz power supply. Special voltages on request. The Nordon Model N400 Block Ice Maker production output at 32º C ambient and water temperature of 21º C is approximately 192Kg per harvest (12 blocks). The N400 can be harvested every 11 hours providing two harvests per day for a total of 384 Kg 24 blocks of ice. If needed, crushed ice can be obtained by supplementing the Nordon Model 400 Block Ice Maker with a Nordon Ice Crusher. Click here for more details on the Nordon Ice Crusher. Contact us to find out how to own a Nordon Model 400 Block Ice Maker. The Nordon Model N800 Block Ice Maker has been engineered as a reliable, low cost and easy to operate ice maker with a long, maintenance free life. A "Bamboo beige" coloured freezing tank and "silver" top frame provides the Nordon Model N800 Block Ice Maker with an attractive colour contrast. The Nordon Model N800 Block Ice Maker uses a fibreglass (FRP) Freezing tank and stainless steel for Ice Mould support to eliminate corrosion. The refrigeration system is a low maintenance accessable hermetic compressor with an air cooled condenser. The freezing coil supported in the Freezing Tank is designed for fast, efficient freezing. Quick release Ice Moulds allow the ice blocks to be easily removed. Each ice block is approximately 100x300x725mm and weighs approximately 16 Kgs. Twenty four stainless steel (24) ice moulds are supplied with the Nordon Model N800 Block Ice Maker. 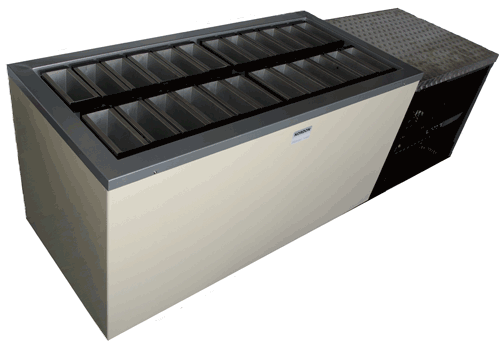 The Nordon Model N800 Block Ice Maker is supplied with two dust covers. As standard the Nordon Model N800 Block Ice Maker operates from 415 Volts 50Hz 3 Phase power supply. Special voltages on request. The Nordon Model N800 Block Ice Maker production output at 32º C ambient and a water temperature of 21º C is approximately 384Kg (24 blocks) per harvest. The N800 Block Ice Maker can be harvested every 11 hours, providing two harvests per day for a total of 768 Kg of block ice (48 blocks). If required, crushed ice can be obtained by supplementing the Nordon Model N800 Block Ice Maker with a Nordon Ice Crusher. Click here for more details on the Nordon Ice Crusher. Contact us to find out how you can purchase a Nordon Model 800 Block Ice Maker. The Nordon electric Block Ice Crusher complements our Block Ice Machines. The Ice Crusher body is of stainless steel construction with continuous welded seams to provide a rigid assembly. Crushing is performed using a zinc treated steel crusher drum, powered by an optional 240V, 3 Phase 50Hz or 415V, 3 Phase 50 Hz electric motor. The crushing rate is in excess of 50 blocks per hour.